I will always love trying new products and learning new techniques but from time to time I find it comforting and grounding to revisit oldies and favourites. This card encompasses both an old and favourite stamp set as well as technique. My very first Stampin' Up! 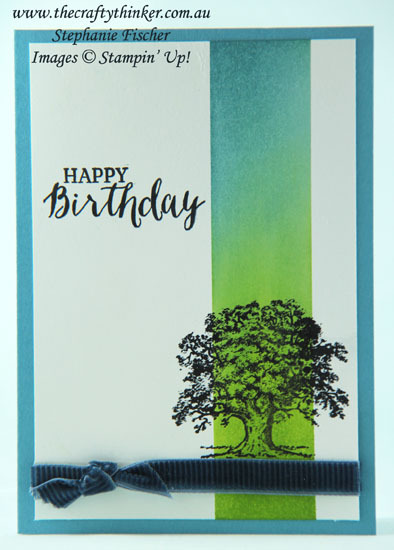 stamp set was the perennial favourite - Lovely As A Tree and it remains one of my very favourite sets for its versatility and beautiful images. It's the perfect set - all occasion, masculine or feminine, easily paired with other stamp sets, and did I say beautiful images! And, it's my go to stamp set for creating little scenes. This time it's the star of the show combined with a little masking and sponging and a little piece of that gorgeous Cordury Ribbon. Voila! A masculine card in no time flat!